AY CDC signs off on extending environmental monitor's contract. Neighbors (and a board member) say monitor's just not effective. The meeting Wednesday March 29 of the Atlantic Yards Community Development Corporation (AY CDC) was relatively brief and mostly uneventful, but one sequence of exchanges encapsulated the ongoing tensions over the project—and the limits to the board's effectiveness as an advisor to Empire State Development (ESD), the state authority overseeing/shepherding the project. The AY CDC board was asked to endorse the staff recommendation to extend for one year the ten-year contract of the consultant HDR, which serves as the environmental monitor for ESD. The contract value is $500,000, and the cost is reimbursed by the project developer. At 550 Vanderbilt, big chunk of apartments pitched to Chinese buyers as "international units"
One key to sales at the 550 Vanderbilt condo is the connection to China, thanks to Shanghai-based developer Greenland Holdings. It's the parent of Greenland USA, which as part of Greenland Forest City Partners owns 70% of Pacific Park (except 461 Dean and the arena). And sales in China may help explain how the developer was able to claim early momentum. "Since 550 Vanderbilt launched pre-sales in June , more than 80 residences have gone into contract, representing over 30% of the building’s 278 total residences," the developer said in a 9/25/15 press release announcing the opening of a sales gallery in Brooklyn. "The strong response from the marketplace indicates the high level of demand for well-designed new luxury homes in Brooklyn..."
Maybe. Or maybe it just meant a decent initial pipeline to Chinese buyers. Well, the first five closings at the not-so-speedy-selling 550 Vanderbilt condominium--which has a Temporary Certificate of Occupancy but is not yet open--have finally surfaced in city records. So we have preliminary clues about the buyers. Acording to the latest Atlantic Yards/Pacific Park Construction Update (bottom), covering the two weeks beginning March 27 and circulated yesterday at 1:59 pm (somewhat late) by Empire State Development after preparation by Greenland Forest City Partners (GFCP), a few changes are expected. Traffic on Sixth Avenue between Pacific Street and Atlantic Avenue is expected to be modified during these two weeks period, with traffic will be limited to one northbound lane. The start date of this work depends on the receipt of the applicable permits. At the Vanderbilt Yard, drilling of foundation piles will begin in the B10 site--just west of Vanderbilt Avenue, between Pacific Street and Atlantic Avenue. Also, 48” steel water main installation is expected to start during this period--location unspecified. And street trees will be planted around 535 Carlton Avenue (aka B14), the 100% affordable building that already has residents. Just in time for tomorro'w's 3 pm meeting (must RSVP today) of the Atlantic Yards Community Development Corporation (AY CDC), parent Empire State Development has posted the agenda and, as usual, it doesn't signal anything crucial. It includes approval of the AY CDC budget and a consulting comment and the president's report, which often includes an update from developer Greenland Forest City Partners--which can be revealing. And while public comments get their own agenda line, they are actually supposed to be accepted after each agenda item (though sometimes that doesn't happen). What are Brooklyn’s biggest challenges? After more than a decade of advocacy and planning, a project to transform three triangular parks along North Flatbush Avenue into pedestrian-friendly islands of green will kick off next week. Below is the full plan, as of 2013, from the New York City Department of Transportation. The Board of Directors of the Atlantic Yards Community Development Corporation (AY CDC), recently postponed, has been rescheduled for Wednesday, March 29, at 3 pm. No agenda has been released. The change in date means that the meeting can't be held, as scheduled, in Brooklyn at Long Island University, but rather will be held at home court: the offices of parent Empire State Development, 633 Third Avenue, at the 37th Floor Conference Room. This meeting is open to the public and will be web cast. This will be the first meeting of AY CDC since 11/14/16, or more than four months. It's going around. Not unlike the way Greenland Forest City Ratner transformed Atlantic Yards into Pacific Park Brooklyn, the unbranded Long Island College Hospital (LICH) project--involving new construction as well as some adaptation--will now be known as River Park, according to Curbed. The name River Park is a natural and fitting evolution for this idyllic location in Cobble Hill. Given the existing park space surrounding and within the site, which Fortis will only enhanced and beautify, and with the serene river adjacent location and spectacular East River views, the name is simply descriptive. Of course, that's exactly what a development with towers of 15, 17, and 28 stories would be called. Just the way a project with 6,430 apartments, an arena, and significant amounts of office and retail space would be called Pacific Park. Update 9:55 am. Now the agenda and board materials are up. 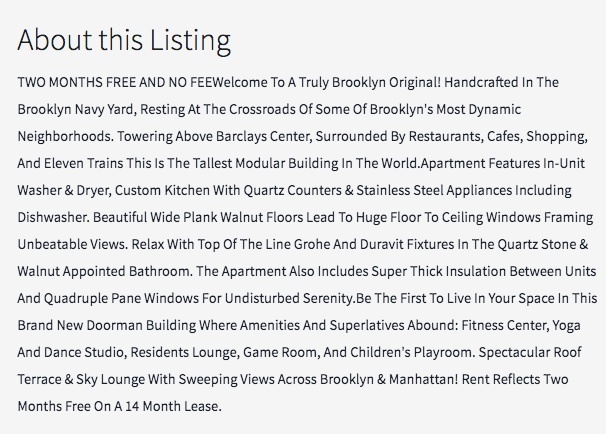 Nothing about Atlantic Yards. So there's a board meeting this morning at 9:30 of Empire State Development, the state authority overseeing/shepherding Atlantic Yards/Pacific Park. Occasionally the project comes up, so it's important to see the agenda to know whether it's worth attending the meeting in Midtown Manhattan, or watching on a webcast. However, as of 5 pm yesterday, the deadline to RSVP to get into the building ("due to building procedures," which surely would be waived if a VIP really needed to get there, right? ), no agenda existed. With less than an hour before the meeting, there's still no agenda, much less board materials. Do the 35th District fundraising totals indicate a tight race? Not yet. So, is the 35th District Council Democratic primary race getting tight, as Ede Fox prepares to challenge incumbent Laurie Cumbo? I'd say it's early. According to the Campaign Finance Board (CFB), Cumbo reported having raised $66,457 while spending $26,732 to net out with $39,725. Fox raised $29,456 and spent $260 to net out with $29,716. While this looks like Cumbo has an edge, it should be noted that she has been fundraising for some time and her total is a culmination of several filing periods, while this is Fox’s first filing. If you just look at this filing period, which ran from Jan. 17 to yesterday, Fox outraised Cumbo by more than 2 to 1. Fox raised $29,976, while Cumbo raised only $13,720. The irony! 461 Dean modular apartments hyped as "handcrafted locally"
Potential renters in the new 461 Dean apartment tower flanking the Barclays Center can not only snag two months free rent, they also can move to a unit that's been "handcrafted locally in the Brooklyn Navy Yard," according to the Douglas Elliman listing. Wait--can this 32-story tower really be pitched like a bespoke ottoman or a seasonal beer? After all, 461 Dean, the first residential building in Atlantic Yards (now Pacific Park), was supposed to revolutionize construction as the world's tallest modular building. Rather than rely on "handcrafted" work at the building site, as is typical, apartment sections (aka "mods") were produced at a climate-controlled, process-optimized factory, aimed to be faster and cheaper. I have an essay in City Limits, Emerging Kushner Deal Suggests What’s Wrong With U.S. Investor Visa Program, about how an emerging deal involving Jared Kushner's family real state firm and a politically connected Chinese company illustrates what's wrong with the EB-5 investor visa program, which purportedly would be used to raise cheap capital. Below is an excerpt, plus video (that wasn't embedded) on the City Limits page. It contains a damning admission about EB-5 by the Nicholas Mastroianni II, he of the "checkered past" (as documented by Fortune's Peter Elkind), who happens to be the hottest money-raiser in the world of investor visas and Jared Kushner's past EB-5 connect: the projects he works on don't need the money. Which confirms that EB-5 is a racket. Ok, in this time of rising competition among luxury buildings and rental "incentives," every developer needs an edge. I've written about deals with Instagram fashionista to produce gauzy, park-promoting advertorial for 550 Vanderbilt (1, 2, 3), which actually came after similar promotion for 365 Bond in Gowanus. The meeting will be postponed to the week of March 27. Details of date/time/location will be issued at a later date. Presumably, an agenda will be issued as well. This will be the first meeting of AY CDC since 11/14/16, or more than four months. It's supposed to meet quarterly. Let's take a look at the shifting line-up of the Barclays Center's corporate partners. We don't know the dollar value of the deals, but... if Long Island University was listed in 2016 as one of the top ten partners, in terms of dollar value, doesn't that signal either that LIU is paying big for the privilege, and/or some of corporate businesses aren't paying all that much? LIU, by the way, has been a staunch supporter of the Atlantic Yards/Pacific Park project as a whole. Below is an excerpt from December 2009 Official Statement (aka prospectus) for the arena bonds. Note that Jones Soda, at least, withdrew and was replaced by Coca-Cola. Also note that MetroPCS had a retail outlet briefly on the north side of the arena--until it didn't. The Nets and Islanders don't fill the Barclays Center, as I reported, with actual gate count significantly less than announced attendance (and maybe worse, for the Islanders). And--guess what--most other events don't even come close. Also, concerts are lots more profitable than anything else (though the business can be fickle). That emerged in the Official Statement released last August for the refinancing of the Barclays Center bonds. It suggests why most (but hardly all) events cause fewer neighborhood ripples than once feared. We've long known some reasons regarding the impact of Nets basketball games: notably, the number of New Jersey-based fans driving to the arena diminished, as fandom declined during the team's long goodbye, and more Brooklyn-based fans, including those who walk, went to games. Though Prospect Heights is absent in the Regional Plan Association's recent report on potential displacement, a new report from the Intersection | Prospect Heights project, We’re All Part of the Neighborhood, starkly details dramatic changes that indeed, point to past and potential ongoing displacement. Consider the dramatic change in income in Prospect Heights, as detailed in the graphic below: as of 2014 (and surely rising), 40% of households earn six figures, up from 15% in 2000. That's well above projections, as noted lower down. The report draws on federal statistics and also surveys sponsored by the Prospect Heights Neighborhood Development Council in 2004 (366 respondents) and 2015-2016 (508 respondents). The surveys are not scientific polls, but the general trends they track have resonance. Prospect Heights, once 53% black and 31% white, has in 14 years flipped to 28% black and 56% white. According to the latest Atlantic Yards/Pacific Park Construction Update (bottom), covering the two weeks beginning March 13 and circulated yesterday at 2:03 pm (somewhat late) by Empire State Development after preparation by Greenland Forest City Partners (GFCP), there are no new work items, at least not as indicated in red with an asterisk. However, not listed as new, but not in previous Updates, is that Con Edison will be working in sidewalk vaults on north side of Pacific Street, across the street from parking garage near Sixth avenue, for new railyard electrical service. Also, the sidewalk shed along Dean Street and Carlton Avenue, outside B14 (535 Carlton) is expected to be removed, as was expected in the previous alert. As shown in the photo at right that I took yesterday, that hasn't happened yet. Incumbent 35th District Council Member Laurie Cumbo faces a likely challenge from one of her top 2013 rivals, Ede Fox, who's formed an exploratory committee. And while the issue of Atlantic Yards hasn't yet surfaced, development issues--notably Cumbo's position on the Bedford Union Army project, far less wary than that of other pols and the 2013 support she got from real estate interests--will surely be important.